Just beyond the orbit of Mars, something is happening to Comet PanSTARRS (C/2016 R2). Astrophotographer Michael Jäger has been monitoring the comet from his private observatory in Gamlitz, Austria, and recording some unusual activity. "This image taken on Nov. 22nd shows multiple jets spewing from the nucleus and a big blue cloud moving downstream in the tail," he says. The comet was discovered in August 2016 by the PanSTARRS telescope on the summit of the Haleakalā volcano in Maui. PanSTARRS's primary mission is to detect near-Earth asteroids that threaten our planet. In the process, it sweeps up variable stars, supernovas, and comets. 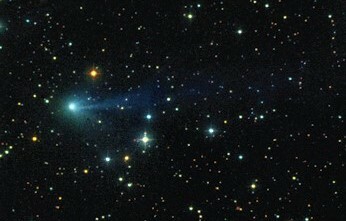 When this comet was first discovered, it appeared to be quiet and ordinary; not anymore. It shows gaseous blobs moving away from the nucleus as well as apparent activity in the comet's inner jets. What's happening? Sunlight could be vaporizing fragile ices in the comet's core, exposing caverns of frozen gas which are puffing clouds into space. Or the comet might be experiencing a magnetic storm. Magnetic storms in comet tails have been observed before--most famously in 2007 when NASA's STEREO spacecraft watched a CME crash into Comet Encke. 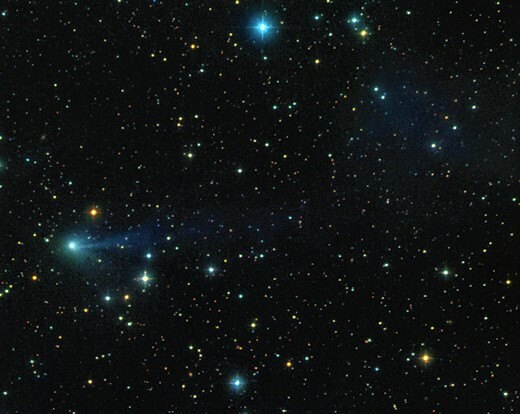 Encke's tail was ripped into forms akin to those Jäger is seeing in Comet PanSTARRS (C/2016 R2). 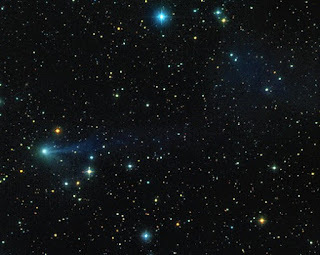 Comet PanSTARRS (C/2016 R2) is currently moving through the constellation Orion, shining with the integrated brightness of an 11th magnitude star. This means it is a suitable target for large backyard telescopes equipped with modern deep-sky cameras. Experienced observers like Jäger may be able to see more action in the nights ahead. Monitoring is encouraged.